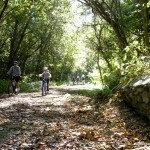 Learn about upcoming work planned for the Flint Hill Nature Trail at this design workshop on April 21st in Osage City. Design Concept For Flint Hills Nature Trail, Osage City FHNT Design Workshop, $10,000 Sunflower Grant, Starlight Tourism, and more trail news from around Kansas. The Prairie Spirit Trail State Park will be enjoying its 18th birthday with a Trail Celebration on March 26th in Garnett, and an open house event on Saturday, March 29, with free access to the entire trail. Learn about upcoming work planned for the Flint Hill Nature Trail at this design workshop on March 10th in Osawatomie. Here's a quick look at the current state of the Western Sky Trail, a rails-to-trails project that will extend between Chanute and Fredonia in southeastern Kansas. Volunteers needed! 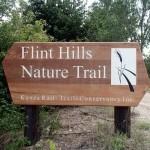 The Kansas Department of Wildlife, Parks, and Tourism and Kanza Rails-Trails Conservancy are hosting two design workshops about upcoming work on the Flint Hill Nature Trail. The meetings are February 20 in Ottawa, and February 21 in Council Grove. 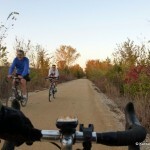 Lawrence To Extend Burroughs Creek Trail, Blue River Rail Trail Connection, Sunflower Quarterly Meeting Feb. 22, and more trail news from around Kansas. 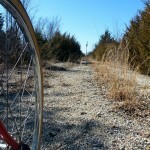 In the late 1970s, Kansas rail-trail pioneers envisioned a route between Leavenworth and Lawrence, on an abandoned Union Pacific Railroad line. Sadly, it was not meant to be, but it laid the groundwork for today's growing rail-trail network. 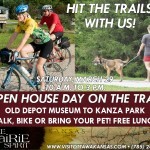 Bear Bridge Proposed To Extend Haskell Rail-Trail; Kanza Annual Meeting; Pedestrian Bridge Over Kaw Proposed; Rail-Trail Organizations Receive Sunflower Grants; and more trail news from Kansas.